If learning was meant to be in isolation, we wouldn’t have schools at all. We would all learn from our own textbooks at home without human interaction or input. But that’s not the way things work. Actually, we learn best when we work in groups, sharing, creating and influencing – together. This is why you’ll often find makerspaces with flexible furniture in learning environments, including schools, libraries, and media centers. What Furniture Works Well in Makerspaces? Providing collaborative and flexible furniture in your makerspace area gives people a place to sit and interact together. Furniture can be arranged to provide spaces for larger groups, small groups, and even create individual workspaces where people can work on their own. How Does Furniture Impact Makerspace Collaboration? Can you have a makerspace without flexible furniture? Sure. But it’s kind of like getting through an area that has roadblocks. It’s possible, but it may take longer to get to your destination. Also, the final product may suffer. When people are encouraged to collaborate in groups, amazing things happen. Makerspaces with collaborative furniture help to foster an environment of collaboration and allows people to work together in the most efficient way possible. Schools, libraries, and research laboratories all have their own versions of flexible furniture that works for their space to foster collaboration among like-minded individuals who are trying to achieve a common goal. The centerpiece should have at least one large work area with lots of comfortable seating. This should be a place people want to hang out, converse and create. Always keep tools of the trade (things like art or craft supplies, drafting tools, etc.) accessible from this space. Idea or suggestion boxes are great additions here as is a showcase of previous work. How Does Fab Lab Design Compare to a Makerspace? A Fab Lab embodies the collaborative spirit, much like a Makerspace. It takes the concept of working together in a collaborative space and brings it global. A Fab Lab is a Makerspace that is equipped with specific tools and with access to programs that can be used to create almost anything. Fab Labs make use of collaborative furniture, much like a Makerspace. Though they may need additional furniture that supports robotics and computer equipment. 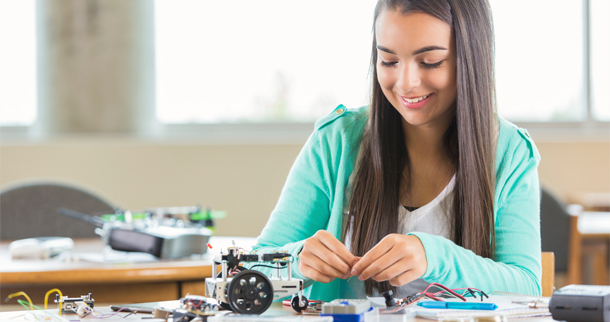 School and other Fab Labs are meant to be collaborative with one another, meaning that something that is created in one can be reproduced in another Fab Lab around the globe. In contrast to our society that is so reliant on mass production and products distributed by large corporations, the Fab Lab program explores how things can be produced from ideas on a small scale. In theory, such concepts may also be mass produced, but we have yet to see a mass produced product come from a Fab Lab. The concept came from a popular class at MIT, How to Make (Almost) Anything. Fab Labs give students a reason to think outside the box and want to create something innovative and useful. Not only do Fab Labs foster creativity, but they can also get students thinking like entrepreneurs. And we all know that these are the students that will be equipped to change the world. (2015) Worlds of Making: Best Practices for Establishing a Makerspace for Your School. Laura Fleming.